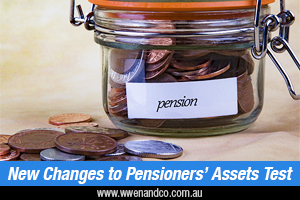 How do the pensioner assets test changes affect me? Starting January 1 2017, the assets test free area and taper rate for pensions increased. The assets test works by reducing your Age Pension payment for every dollar of assets owned over a certain value. The test takes into account most assets, including any property (except your primary home) or possessions you own or partly own, in or outside Australia. The assets test is one of two means tests used by the Department of Human Services (Centrelink) to determine your age pension eligibility; the second being an income test. The results of these tests that produces the lowest pension payment (or zero) is then applied. What is the asset test free area? The asset test free area is the amount of assets you can have without affecting your pension. Centrelink will reduce your pension by $3 each fortnight for every $1,000 of assets you own over the assets test free area. This is called the taper rate. Before January 1, this rate was set at $1.50 (so it is now double at $3). Some people will have received more or have no change to their pension, but there is also the possibility that thers may have their pensions reduced or even cancelled. What if I lose my pension due to these changes? Centrelink states that if you lose your pension due to the January 1 changes, you will automatically get a non-income tested Low Income Health Care Card, and Commonwealth Seniors Health Card if you are Age Pension age. The Health Care Card provides concessions on water rates and energy bills, among other discounts, and the Commonwealth Seniors Health Card provides discounts on prescription medicines and bulk-billed doctors’ appointments. This table outlines the before and after assets test thresholds, or disqualifying limits, for the full age pension. The following table lists the thresholds for a part age pension.